Seven has revealed its contenders for My Kitchen Rules season 4, many of whom have been pumped in network promos. This year the hit show is also promising “a few extra surprise guests” for dinner. Welcoming a new judge along with blind taste testing for the first time, the biggest shock for audiences will be seeing who’s crashing the My Kitchen Rules dinner parties. One thing is certain: there are plenty of surprises in store when My Kitchen Rules launches on Monday, January 28 at 7.30pm. Manu Feildel and Pete Evans return to host and judge the ultimate home-cooking battle as they accept dinner party invites in each state across the country. This series we welcome new guest judge Colin Fassnidge to the table alongside returning guest judges Guy Grossi, Karen Martini and Liz Egan. Director of Network Productions Brad Lyons says: “We’re thrilled with the continuing success of such a well-executed local production. It’s state versus state, plate against plate, as 12 teams of two attempt to out-dine and out-wine each other to see whose kitchen rules. There will be triumphs, kitchen fires, laughter, tears and plenty of opinionated guests as they battle the clock and their nerves to plate up on time. The home-grown Seven production has built a huge following since it premiered in 2010. It has grown year-on-year and when South Australia’s Leigh and Jennifer won the title in 2012, an audience of 2.89 million was watching. The third series averaged 1.8 million across its 37 episodes. The top two teams will again battle it out in the grand final where they will present their ultimate dining menu to a full restaurant. With $250,000 in prize money on offer, the knives will definitely be out. i will probably end up watching it, but as others have said, the promos have been heavy handed, i mean they’ve been showing them relentlessly since before Xmas. It seems a silly way to go about it, if they’re trying to attract new viewers bombarding them with repetitious promos would more likely put them off, & the people who are already fans will watch it anyway so why annoy everyone else who has no interest in it by playing them over & over?? also wondering why they have focused the promos heavily on the father/son & brother/sister teams, do they think they will be the most popular or controversial? Well most of the comments here certainly don’t reflect the great ratings that this show gets, and I predict it will rate better than ever this season. MKR is my favourite reality/light entertainment show ever ! And it isn’t just about the people, the food is also a big part of it. It just doesn’t take itself as seriously as other cooking shows. Terribly contrived television. I have no intention of watching. I’m already cringing at the stereotypical bitchy gay guy. 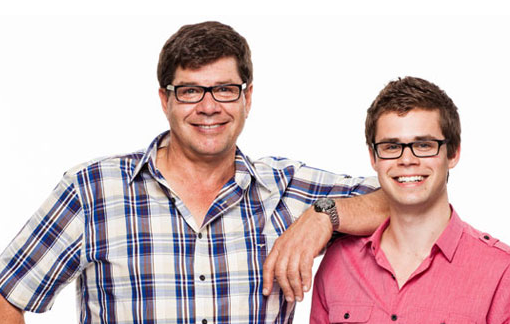 Seems the MKR casting dept just can’t resist relying on stereotypes. This year and last year. Can’t wait. Here’s hoping for an all South Australian final again. There seems to be a theme for SA though, last year we had the princess and now bloody miss cupcake. The “sneak peaks” have been too long, too boring and too repetitive. It has already started to impact my watching of the Tennis. I switched off last night well before L.H. started losing… ( I assume he lost)… because of a M.K.R. promo. the promo’s for mkr make me want tune out. i am so sick of seeing them.